Proposed redevelopment of Hudson Yards. Image: dbox, courtesy of Related Companies. $1.054 billion offer adds more affordable housing than Tishman’s plan. On March 26, 2008, the MTA selected Tishman Speyer to develop the John D. Caemmerer Rail Yards, also known as the Hudson Yards. 5 CityLand 46 (Apr. 15, 2008). But on May 13, 2008, Tishman withdrew its proposal, prompting the MTA to select a proposal submitted by a joint venture between the Related Companies and Goldman Sachs. Related/Goldman’s proposal is equal in value to Tishman’s, but calls for more residential space, at 5.3 million sq.ft., less commercial space, at 5.5 million sq.ft., and more public space, at 15 acres. Moreover, 20 percent of all residential rental units, approximately 440 units, will be permanently affordable. The new proposal also seeks to retain the entire High Line; unlike Tishman’s proposal, which called for removing the 10th Avenue spur. 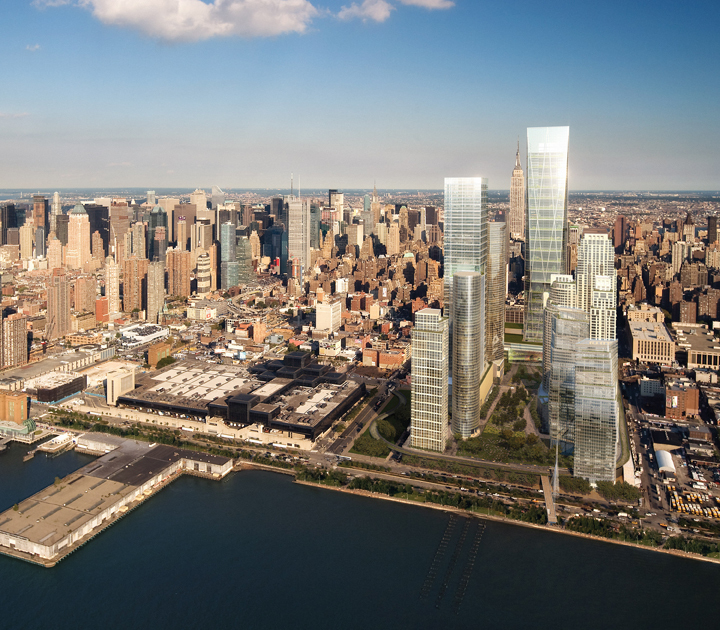 Related/Goldman will now negotiate a 99-year lease with the MTA to develop Hudson Yards. However, in anticipation of unfavorable economic conditions, the agreement will allow the developer to delay certain rent payments for up to two years on parcels where it has not started construction, provided that the developer guarantees to pay the MTA deferred rent either when it starts construction or once the delay period ends, and as long as the developer agrees to increase its future rent by 50 percent of the deferred amount. The MTA expects to enter into a contract with Related/Goldman within the next few months. Once the contract is finalized, the public review process for rezoning the western site will begin. MTA: MTA Staff Summary, West Side Yard Development, Joint venture entity of Related Companies L.P. and Goldman Sachs Group Inc. (May 22, 2008); MTA, Press Release (20-08) (May 19, 2008).